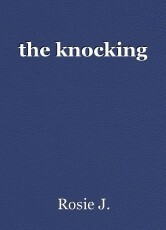 the knocking, short story by Rosie J. Short Story by: Rosie J.
I was awoken by knocking on my bedroom door. It was strange because my parents were out of town for their anniversary, and I'm an only child. The footsteps outside my door creeped me out. "Hello? Who's there?" I called out. When there was no answer, I pulled the covers up to my chin. "Whoever's there, just leave me alone!" I could see the shadows below the door just lurking behind it. I was afraid to open it, and I now know I'm going to demand a lock on my door when my parents come home. The knocking intensified. So did my fear. The knocking continued. Then, it stopped. Huh? I thought. I thought it was finally over, but I was DEAD wrong. The Anonymous Knocker knocked one more time, and all I could see was the shadow backing up. I thought the mysterious knocker left the house. I was wrong. Again. I pulled the covers over my head and lay down, trying to pretend that no one was knocking on my door like I just stole of something theirs. As I began to fall asleep, the door flew off its hinges! I finally got a good look at the mysterious figure. But as soon as our eyes met, the figure disappeared from its chest, outward. After that, I just stared at the ceiling. For the entire night, as the door slowly put itself back up. The next day, I was still staring at the ceiling, stuck in the same position as I was last night. I never left my room except for the bathroom and if I was hungry. Night fell before I knew it. Since I had nothing to do but lay in shock, I decided to fall asleep. As soon as I began to fall asleep, guess what I heard. You guessed it: the knocking. "Ugh, I can't take anymore of this!" I shouted. I got out of bed, and opened the door faster than you can say "Don't!" When I opened the door, I was so scared and shocked that words can't describe it. My parents are still out of town, and like I said before, I'm an only child. And besides, I can't think of anyone else who would be knocking at my door so intensely at two in the morning. So when I opened the door, I was so shocked to see no one standing in the doorway. I wanted to faint right then and there, but I knew I would never forgive myself if I did. I tried to move, but I couldn't. I tried to speak, but I couldn't either. I didn't want to stay awake in the same position as I did yesterday. I was finally able to move and I slowly walked backwards to my bed, not even closing the door. © Copyright 2019 Rosie J.. All rights reserved. Other Content by Rosie J.